You might want to consider these easy 60-minute trips outside Pokhara for a quick rejuvenating break on this Christmas weekend. Built in 1993, this cozy little boutique lodge in Dhampus offers the most stunning views of Annapurna South, Hiunchuli, and the Machhapucchre peaks from almost anywhere inside and outside the lodge. You can simply sit in the grassy lounge and relax for hours gazing at the mountains. On a clear night you can see the star-filled sky. There are five rooms in the lodge that are quiet basic, but charming, with minimum furniture, neutral tones, parquet flooring, rugs, and mud walls. Each bed has a Japanese quilt, and guests are served with hot water bags in winter. The lodge has its own kitchen garden, and all meals are prepared using fresh seasonal produce. While you’re there, go to the view tower, a 10-minute steep climb from the lodge, to watch the first rays of sunlight on the Himalayan peaks. Then, head out to the famous Australian Camp, an hour’s hike from the lodge. From the hilltop, you can see close views of the whole Annapurna range. You can also see Manaslu and Peak 29 from here, and Lumle at the end of the opposite hills. Take a quick stroll around the village through the cobbled alleys in the evening, prior to a long soak in a warm bath. The lodge has a unique bathing facility called ‘ofuro’ (a soaking tub in Japanese). Guests are served local spirits and snacks while they hunker down by the iron heater as the staff prepare the dinner. Fancy something a little different? Then you’ve got to visit this permaculture resort in Astam, Kaski, which grows its own food, and is only partially dependent for its energy needs. Built in 2001, this resort is located some 15 km northwest of Pokhara and spread over 75 ropanis of land. There are five cottages in the resort, each having a private balcony facing the mountains, with a large sitting area and garden view. 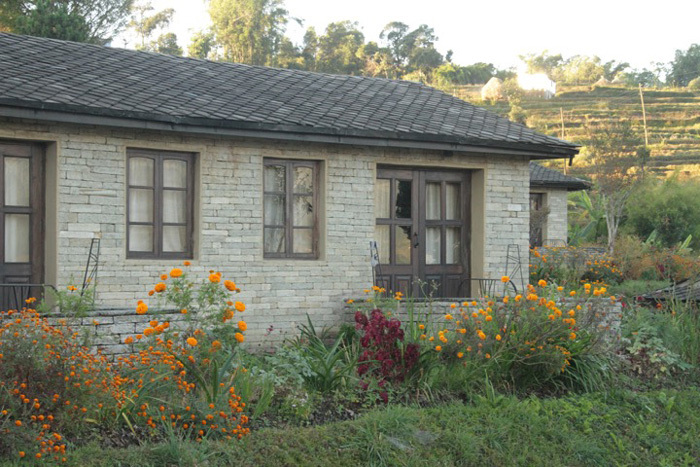 The cottages made of stone and mud are built on slopes, and blends almost seamlessly with the natural landscape. Energy for the resort is partially provided by solar panels, and they use bio-gas for cooking. The landscape is both beautiful and practical. A stroll through the resort reveals several acres of organic vegetable and herb garden where they grow their vegetables and fruits, from lettuce, parsley, hakusai (Japanese cabbage), bok choy, eggplants, and broccoli to kiwi, guavas, and oranges. You can also plant vegetables and learn to cook Nepali meals from the staff. Having chickens, buffaloes, goats, and apiaries in their farm, the resort rarely has to buy milk, butter, yogurt, meat, and honey from outside. The resort only uses hand-woven, naturally dyed organic-cotton fabrics, and does not use any chemicals or pesticides. They even make their own candles and lip balms. This place is a treat for those seeking peace and solitude. A true haven for those in love with nature. Day 1. Fly to Pokhara, drive to Phedi, and then hike or drive to Dhampus (stay in Tsukinoie, 3 meals included). Day 2. Hike to Astam (3 h). Stay in permaculture resort, Hananoie (3 meals included). Day 3. After breakfast, hike to Milanchwok (1 and ½ h), or drive to Milanchwok, then drive to Pokhara Airport and off to Kathmandu. Nepal Kaze Travel (P) Ltd.